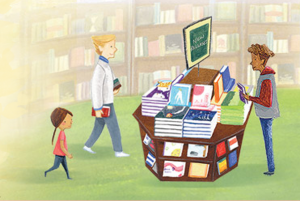 It’s Barnes & Noble Shopping Week! Meet Ray Didinger!!! The Philly icon…sportswriter, radio personality, pro football hall of fame member will be at B&N on Saturday, December 1stat 3pm. Grab a coffee or breakfast/lunch in the café and do a little holiday shopping. Pick up a book to donate to New Eagle’s Day of Giving (Dec 4th) – a table will be set-up upstairs with book recommendations. Pre-order holiday desserts in the café (they can be picked up anytime in the month of December). Get all of your holiday shopping done!!! Present this voucher or simply mention New Eagle, prior to making your purchases. You MUST mention New Eagle in order for your purchase to be credited to our school! Stop in between Saturday, Dec 1stand Saturday, Dec 8thor visit BN.COM/bookfairs to support us online and enter Bookfair ID 12455564 at checkout. A percentage of your Barnes & Noble purchases will benefit the New Eagle PTO. Questions? Contact Kim Farrand at kffarrand@gmail.com. Thank you for your support!